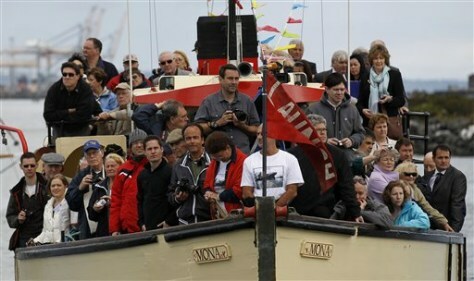 People gather on a boat in Belfast Lough, Northern Ireland, on Tuesday, to a attend a religious service at the exact spot were the Tittanic was launched 100 years ago. Among the guests invited were local school children and descendants of people who worked on the ship. The ship entered Belfast Lough on 31 May 1911 from Harland & Wolff, then the largest shipyard in the world.